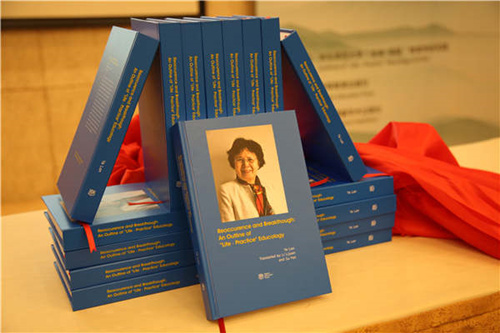 The English version of a book on educology that explores the relationship between life and practice was published in Shanghai on May 14, three years after the release of the Chinese version. The book, Reoccurrence and Breakthrough: An Outline of "Life-Practice" Educology, reflects on the history and theory of combining life and practice in the educational process to offer new perspectives on Chinese education. The term educology refers to the fund of knowledge about the educational process, including understanding gained from theoretical, philosophical, scientific and praxiological perspectives. Ye Lan, the author of the book and a professor at East China Normal University, has been researching this field with her team for around 30 years. "Based on Chinese culture, I answer the question of 'What is education?' in the book," says Ye. "The edition puts forward the idea that education promotes the quality of human life and demonstrates its trait of humanistic care through imparting knowledge about heaven, the Earth and human beings, while cultivating self-consciousness in life." "The readers may understand that pedagogy is an independent discipline. Through the book, we demonstrate that the complexities, such as hierarchy, sociality and dynamism in educational practices, determine that pedagogy is a complex discipline focusing on education," she says. The book first illustrates the link between the practicalities of primary education schooling, social development and the need for an outlook like a school of educology. The author also makes it clear that Western philosophical views of education are significant but need to be adapted to be based more on the principles of Chinese education. Ye puts forward an independent China-based discipline, and discusses the meaning of education. The basic Chinese cultural thoughts are demonstrated in the last chapter to ground educational thought in Chinese historical narratives. School practices on the idea are shown to the readers. Michael Connelly, a professor at the Ontario Institute for Studies in Education at the University of Toronto, writes the preface to the book, saying it will offer profound insight into contemporary Chinese educational thought to Westerners. "Ye critically explores Western thought along with historical and current Chinese thought to create an independent philosophy of education," says Connelly. "The intellectual and historical range of the book provides interested readers with knowledge on subjects like Chinese political and cultural history, and practical educational reform initiatives, in the context of East-West tensions," he adds. Zhang Xupei, an adviser to the Academic Committee of the Council at the Chinese Institute of Education, said Ye's point will shed light on the future advancement of Chinese education, such as advocating the idea of combining education with learning.